Ross McNab, Director of Digital Advertising Solutions at Eyeblaster is an experienced and prolific contributor to the digital media landscape, delivering thought leadership across the globe by leading conversations with high-level business, marketing and agency executives worldwide. Throughout McNab’s global experience, he’s worked closely with agencies to roll out solutions on a regional scale, helping advertisers to work in diverse markets to achieve brand impact through digital. With a background in mobile, online and marketing, McNab is instrumental in helping advertisers and agencies implement enhanced marketing strategies which balance across direct response and brand requirements and establish a framework that monetizes media and tracks results. Past speaking engagements include iMedia Summits, Ad Tech, Asia Business Forum and MSN Roadshow among others. Prior to joining Eyeblaster in 2005, McNab worked with Microsoft, PBL Media and Australia’s BlueSkyFrog and now resides in New York City. The explosion of "Web 2.0" distribution models offers corporate communicators free sharing, huge reach...and very little control over the audience or message. This session will cover how affordable enterprise video publishing systems can provide the best of both worlds: boundless distribution options with complete control over creation, approval, presentation, and measurement of video communications. In this session, you'll learn how a successful strategy always begins with your own Web site, including tips on how embedding video content into contextually relevant pages on a site -- together with social networking features, podcasts and other documents -- can dramatically increase viewership, relevance and brand affinity. Learn 10 secrets to success that the world's most successful brands already know! Part of the Upshot Institute Landing Page Bootcamp, this presentation showcases real-world examples of organizations improving the performance of their landing pages. Marketers today are required to find and connect with target audiences in real-time, wherever they live, work, play and learn. In order to boost ROI and campaign effectiveness, marketers should consider applying "tri-messaging" best practices - a catalyst for conversations and marketing ROI across three dominant channels. Tri-messaging is essentially marketing messages that are written, packaged, orchestrated and unleashed for email, social and mobile experiences. Through this method, marketers can essentially understand and reach end-users where they prefer to engage and interact. In turn, this facilitates conversations, commerce and loyalty that can subsequently be managed, measured and monetized. You're probably spending time and money to drive visitors to your website. Maybe it's a pay-per-click campaign, direct mail, or print ads. Maybe you spend a bunch of time on twitter, or flying around to trade shows. Whatever you do, if you're not testing everything, measuring your results, and optimizing over time... you're leaving a TON of opportunity on the table. In this 10 minute presentation, you'll see how one small business lowered his cost per lead 80% with 3 hours of work. You'll learn not just WHY to test your marketing but HOW to test anything and WHAT kinds of changes are most likely to improve results. Marketing Automation technologies – including lead nurturing, lead scoring and lead management are critical today more than ever. During this webinar, Manticore Technology's vice president of marketing, Christopher Doran will provide insight into how your peers are adopting marketing automation and the business impact they are seeing. He'll offer insights on marketing processes and share best practices necessary to get the most out of marketing automation. If you have researched a product or service either for personal or business use in the last 12 months, ask yourself how your search began. It’s a good bet a significant percentage of your pre-purchase research occurred online. As a B2B marketer, you can rest assured; the vast majority of your sales pipeline in the next 12 months will come from prospects that began their search for products and services on the web – probably through some combination of Google, association websites or via direct organic research. 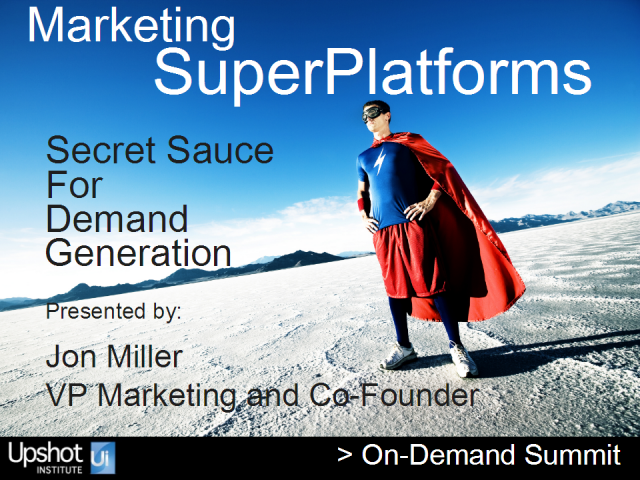 10 Minute introduction to the Upshot Institute Marketing SuperPlatform Summit. Marketing automation has become an even more critical opportunity for any business with a marketing budget as the pressure to ensure ROI for marketing campaigns increases. As part of the Upshot Institute Marketing SuperPlatform Summit, this presentation provides an overview of marketing automation basics and how to apply these ideas to your organization. In today’s world, Sales and Marketing needs to be aligned to ensure that no lead is left behind and that every opportunity receives the right service at the right time from the right team member. In this informative session, you’ll learn how new technologies are eliminating the Sales and Marketing disconnect, driving more qualified leads into Sales for a more efficient pipeline, better customer service and ultimately faster sales. This presentation is an overview of the Knotice Concentri™ product. Direct Digital Marketing, a relatively new term that is defining a new technology market segment, has become increasingly important in today’s digital marketing landscape as consumers are demanding relevance in communication they receive from marketers. However, there has always been a disconnect between the consumer’s demand for relevance and the marketer’s ability to supply it. In his presentation, Brian will discuss the evolution of direct digital marketing, the definition of direct digital marketing and how it will affect the industry, the tools needed to successfully execute it, and common misconceptions surrounding direct digital marketing. As the Director of Operations, Tim Kauffold is in charge of planning and overseeing the execution of Oneupweb’s strategic vision. Handling everything from employee concerns to client side technology issues, Kauffold’s role in the organization is critical to its mission. Tim brings nearly a decade of experience in successful online operations and innovative marketing to the Oneupweb team. The rate at which your landing pages convert traffic to leads and sales is one of the most important aspects of Internet marketing. This 15 minute presentation is jam packed with actionable tips and examples you can use to create new landing pages or instantly boost conversion rates on existing pages. Lisa Wehr is CEO and founder of Oneupweb, a digital marketing agency. She has been counseling clients on improving website ROI and search engine marketing since 1996. Oneupweb is an innovator in digital marketing, creating integrated online marketing plans that incorporate natural search engine optimization (SEO), paid search marketing (PPC), conversion improvement and analytics, podcast production, social media marketing, online media planning and placement and search marketing consultation for in-house marketing teams. Heralded by an independent research firm for their leadership team, Midwestern work ethic and solid experience in optimizing complicated sites, Oneupweb has twice been named a Top 20 Search Marketing Agency by Advertising Age, and CEO Lisa Wehr is recognized as an Ernst & Young Entrepreneur of the Year. To contact her, visit OneUpWeb.com, email info@oneupweb.com or send her a tweet @LisaWehr. Gone are the days when marketers could get away with “shouting” at customers by blasting them with messages and treating them differently in every channel. Today’s customers and prospects have too little patience for irrelevant marketing messages and too much control over their own exposure to them. The time has come for marketers to engage their customers and prospects in a cross-channel dialog that builds on past and current behavior. Unica calls this “Interactive Marketing.” In this presentation, attendees will learn more about Interactive Marketing and the key technology requirements needed to support it. Upshot Institute provides resources to help marketing professionals improve their awareness of emerging marketing technologies and their effectiveness using existing marketing tools.